This is a simple-dimple quickie MANGO treat that Rasa, my sis-in-law, made for me once and I've been loving it since then. 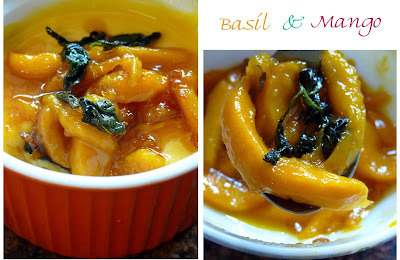 Fresh basil and mango are one of those perfect flavour combinations - sweet and fresh. I like using a slightly sour mango for this recipe. While frying, the mango will release some of the juices which will make this lovely shiny caramel sauce sweet&sour. I have it either by itself while still warm or as a topping for a dessert. 1. Melt the butter in a frying pan and mix in the brown sugar. 2. Let it melt and once it starts bubbling up, add the mango slices. Mix it well so that the mango gets covered with the caramelized sugar completely. 3. Fry it for another moment and add fresh basil leaves. Stir it and you are done! If mango is very ripe and sweet, you can add just a drop of lime juice. And if you are feeling adventurous, add BAM! a tiny pinch of red chili powder. It enhances the taste of sweet fruity and chocolate desserts! Derinys skamba nuostabiai. man bazilikas toks universalus ir visur tinkantis prieskonis. Įtariu, kaip skanu. reiks eit pc paieskot mangu (gaila pas jus jie ne is tolo neprimena tikruju mango, bet vistiek). Egle - budavo skanu ir Lietuvoje su mangais, kuriuos ten importuoja. Tiesa pasakius, ir cia dazniausiai sitam receptui sunaudoju ne pachius geriausius - rugstesnius ir kietesnius. Jūrate, kaip gerai, kad išsaugojai tą receptą, nes per visus persikraustymus aną kažkur nudanginau. Dabar kai prireikė jubiliejui, radau pas tave :) ačiū!